While the astronauts in the US segment of the International Space Station (ISS) are working on returning their spacesuits to full service, the Russian segment conducted another, somewhat routine, extravehicular activity (EVA). RS EVA-41, the only Russian spacewalk of 2015, began at 10:20 a.m. Eastern on Monday and completed all of the tasks ahead of schedule. Among the objectives of the spacewalk, designated RS-41, were the installation of gap spanners, maintenance of antennas used for communication with visiting vehicles, cleaning of a window, and science experiment work. The spacewalk began on schedule at 14:20 UTC (10:20 a.m. Eastern) with cosmonauts Gennady Padalka and Mikhail Kornienko egressing the Pirs airlock. Padalka was EV-1, wearing an Orlan spacesuit with blue stripes. Kornienko was EV-2, although his suit also has blue stripes. 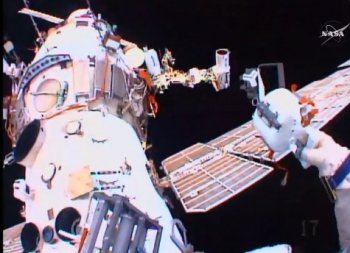 Their first task was to install a gap spanner between two handrails on the Service Module (Zvezda). This installation was planned for just five minutes, as the two handrails are very close to each other. That proved to be the case – along with the pace of the entire spacewalk – as the duo proceeded through their tasks at good speed. Gap spanners, literally translated from Russian as soft handrails, are straps that connect handrails on the hull of the station. Cosmonauts use the gap spanners to translate past various obstacles more easily. Then, the spacewalkers moved to window No.2 on Plane IV of the Service Module, and cleaned the window from rocket engine exhaust that deposits on the exterior of the station as visiting spacecraft arrive and leave. Using a tool that was more akin to something used to buff wax on a car, the window was cleaned after about five minutes work. 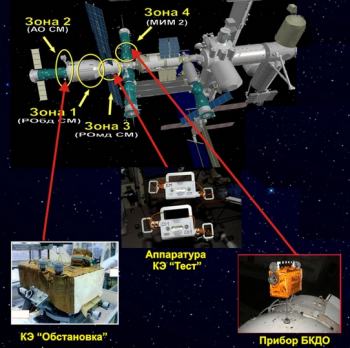 After the cleaning, the pair of cosmonauts translated along a series of handrails to the WAL1, WAL2, and WAL3 antennas, which serve communication between the Russian segment and approaching and departing visiting vehicles. They installed fasteners on all three of these antennas, which proved to be troublesome at first, before the task was successfully completed. The fasteners are designed to prevent the antenna covers from inadvertently coming off – an issue observed back in August 2013. This task was followed by a visual check of their spacesuits, glove cleaning, and jettisoning of used towels. Two towels were jettisoned in total. The next activity on the EVA timeline was the photography of the Expose-R experiment. The experiment examines how microgravity and the conditions outside the ISS affect different biological samples. The pictures taken will reveal to investigators whether there has been any change to the materials involved with this experiment. Another experiment that the cosmonauts worked with was the Obstanovka experiment, which investigates plasma wave processes in the vicinity of the ISS. Commander Padalka dismantled a sensor unit and stowed it in his crew lock bag to bring the sensor inside the station towards the end of the spacewalk. Next up was the installation of another gap spanner and sampling of a radiator panel surface as part of the Test experiment. More sampling took place near the Russian environmental and life support systems overboard vents. The systems sampled was Vozdukh (carbon dioxide scrubbing) and Elektron (oxygen generation). After the sampling, the cosmonaut duo returned back to the airlock and stowed their crew lock bag which contained the sensor unit from Obstanovka and the used sampling kits. They retrieve more equipment related to the antenna work and also a brand new antenna to replace the WAL6 antenna. 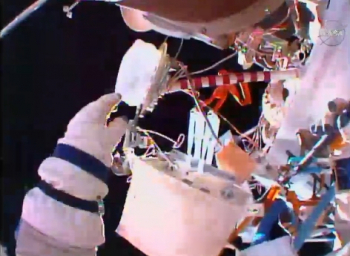 Next, the EVA crew then installed fasteners on the WAL4 antenna. The final antenna maintenance task was to cut off cabling from the WAL6 antenna, remove the antenna and install its replacement. After they routed and connected all the necessary cables for the new antenna, the two headed back to the airlock and jettisoned the old antenna. “Bye bye” was the call as the antenna was sent on a retrograde path away from the Station. This proved to be the final task, as the spacewalkers had already translated to the Poisk module, where they reposition BKDO, a piece of equipment which measures rocket engine plume impingements on the station’s hull. With all tasks complete – ahead of schedule – they returned to the airlock to wrap up the EVA. The total duration of the excursion was 5 hours and 31 minutes. (Images via NASA and Roscosmos).